We have 2 guineapigs. A 4 year old female bought from Petco in Knoxville, Tennessee (not a cuy) and a 4 month old female cuy bought from Petco in St. George, Utah. 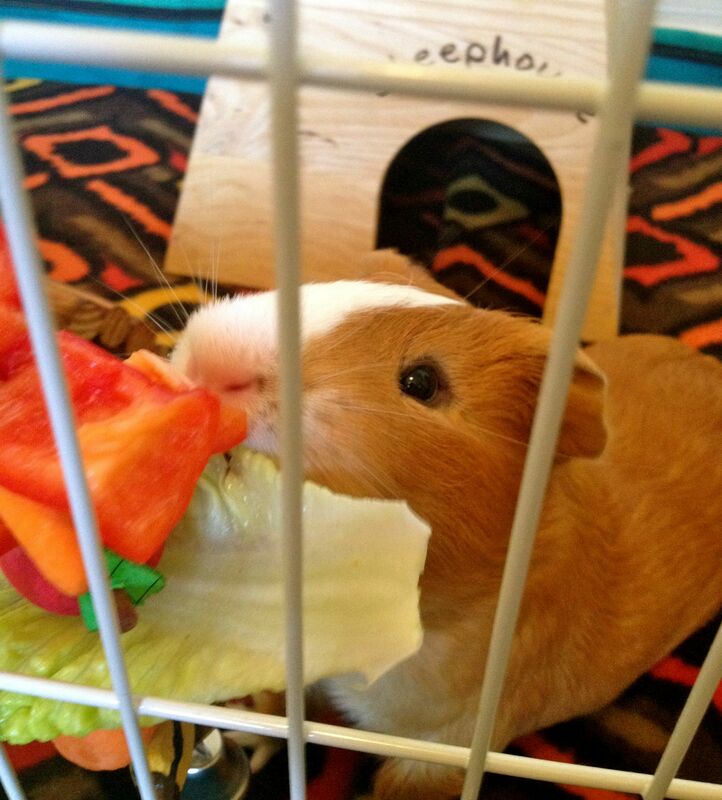 This is the second cuy we purchased from Petco in St. George this year. The first we bought in early May. She seemed like a normal little piggy in the store but after bringing her home we realized she had some sort of breathing difficulty. The breaths seemed to come from just in front of her hind legs in stead of further up in the chest. She wanted to run in play but didn't for very long because she would get winded. We had her in to a vet but they couldn't find anything wrong. She was difficult to catch but was a huge cuddle bug in your arms. She grew extremely fast and was quite large though I can't find the paperwork from the vet to say how big. If I remember she had an extra toe or so on the back feet too. She was white and caramel. We found her gasping for air one evening and I held her for about an hour before she passed away at about 5 months old. We needed a cage mate for our older girl and went back to Petco since there weren't any other stores or shelters nearby. They didn't have any females, said they had had a shortage of females for about a month to check back wednesday when the shipment comes. We checked back and they had several females so we went to town to pick one up Sept 24th. We checked them over knowing that we had got a cuy and it had breathing issues. The little one we picked screamed bloody murder as I held her but she seemed healthy so we brought her home. She could fit in my palm. She is red and white, no extra toes and no apparent health issues. We waited a day to introduce the two (expedited by Samoa's searching for her old friend and smelling a piggy in the house). After letting them meet and play on the floor for a hour or so we caught the little one and put her back in her tote. We had the lid 3/4 of the way on but we heard squealling and went running to find the baby had escaped and they were playing again. She is fast and strong, hard to catch, lots of mid air catches after cornering her or trapping her in a box or pigloo. She bolts often, doesn't like the light, always wants to hide. After 3 months of spending several hours in the same room with her and catching her every couple days or so, she is starting to trust us and tolerate being petted once caught. She knows that if she bites, she will get put down but a firm voice as she starts to bite has started to correct that. At 4 months she is already 12 inches or more long and approximately 2 pounds (roughly the same size and weight as the 4 year old). They get along very well together as did the last cuy and our non-cuy female. We stop by the pet stores to see the piggies regularly and we've noticed the St.George Petco seems to mostly have cuys though they are hard to tell when they are very young. They seem to all be red and white and if not a fresh litter you can see the larger sizes and the skittishness. Sascha, 1 year old, given to me last summer by someone who couldn't keep her, 3.5lbs, tri color crested, no abnormalities besides size, relatively delicate feet, extremely skittish even after picked up, will shoot out of your arms. I found out today that one of the local Petcos is selling cuy. I'll have to go check it out for sure. I have three now at the rescue. I've had no luck pairing them with others-they don't seem to get along with other pigs. Is this something others with cuy are noticing? One of the volunteers with one of the southern California rescues told me that as the female cuy were getting older, that they got harder and harder to bond. I've been having the same difficulties. It was real easy when they were younger. But I just got the sweetest male cuy in named Maxwell (supposed to be 2 years old) and he was so easy to bond with an adult non-cuy male named Wayne. 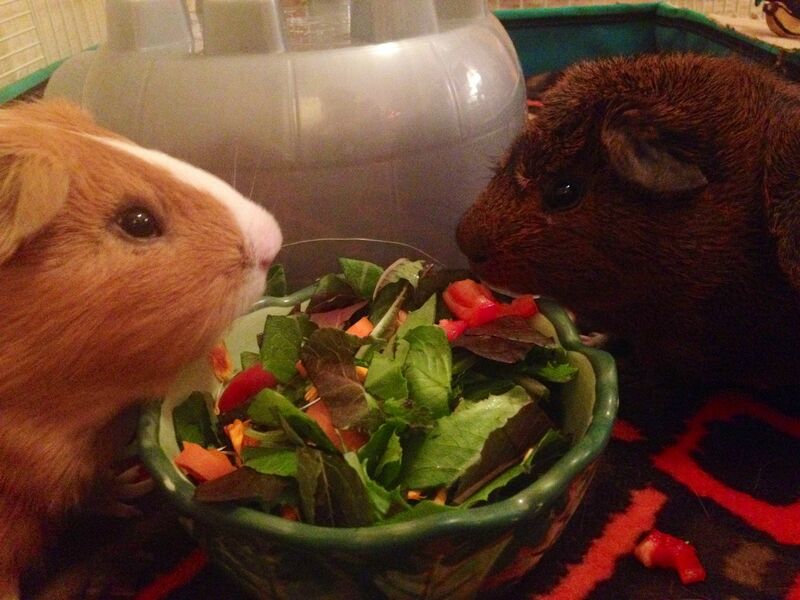 The non-cuy recently had both eyes removed due to glaucoma and Maxwell continues to be a very gentle buddy to Wayne. We've had way more female cuy than male cuy here so I don't know as much about the male cuy. That's too bad that your Petco is selling cuy. I bet that they don't even know what they have. You might want to give them a heads up about what to expect. The baby cuy are so cute. CavyHouse, do you know or can you find out to whom the older female cuys were trying to be paired with? Such as babies (under 6mon) guinea pig or cuy, male/female or female/female. I would appreciate it very much. I was at the Ewa Beach Petco today (I'm in Hawaii) and they had a cuy there. It was my first time seeing a cuy in real life but I'm pretty sure it was one. This was a gigantor guinea pig, red and white with short hair, but she was so cute. The employee told me someone bought her and returned her. I know I shouldn't buy from pet stores, but I was so tempted to take her home, and probably would have if I weren't out of a job and possibly moving off the island soon. I was so sad to leave her behind. I read this whole section last night as I couldn't fall asleep, I came because I saw my neighbors piggies for the first time up close. They are huge, sometime next week, I am going to weigh them and get photos of the two big boys. One is all orange and is white and orange. My biggest male that died of bladder stones was 3 1/2 pounds, he was small compared to these guys. We live in Maryland. I will find out where they got them and when too. How do you tell if you suspect a pig is only partly a cuy? Snuggles (the mom of three babies bred with her supposed brother) is orange/white with a slightly bigger nose than the others and her ears flop more. She is heavier than the others but not by a lot. She is laid back, but snuggles on me after I catch her. None of our piggies like to be caught, though, except for Panda, who definitely has a smaller, pointier nose than the others. The others will run like crazy and try to squirm out of our hands, but once in our laps will settle and even purr. Abnormal: The only things abnormal about him besides his size were his boy parts. His testicles were very large. Temperament: When I first got him, he was very skittish and terrified of everything. After getting him another boy to share the cage with, he started to get more comfortable, and would give my finger loving kisses and nibbles. This took about 5 or 6 months, but eventually he became less afraid and more trusting, but even after a year of spoiling him, he was still twitchy and any noise besides that from me talking to him would scare him into the pigloo. Health Issues: When he popcorned, he would sometimes wind up on his back for a few seconds, still shaking. I wasn't sure if they were seizures or a result of him being too muscular for his own good. He may have had diabetes toward the end. He passed a few weeks ago, I think at about age 3. I came home from work to find him "heaving"...It looked like he was trying to vomit but of course piggies can't do that. I observed him for a few hours and he became lethargic and stopped eating/drinking. I took him to the vet and they weren't sure what the problem was without doing dangerous, expensive tests... He was in a very fragile state and they gave me pain meds, antibiotics and food with which to hand feed him every hour. I did my very best with this and he seemed to be accepting of the food at first, but by 10pm he stopped swallowing anything and stopped moving. When I came in at 11, he had passed. The vet said he thinks it may have been a dental issue like an infection, due to his foul smelling breath. He also said that cuy have shorter lifespans due to their original breeding as livestock, not pets. Do not use image tags on such big pictures!!! I stripped them out. ONLY use LINKS. I feel your pain ...... for our family lost our baby of 3 years, Baldwin, a cross-cuy piggy on Jul 12, 2015 - less than half an hour after the vet gave him anti-biotic and anti-pain. Although skittish, this piggy loves to be petted, he will even close his eyes and settled down before our hand even reach his head. Strange for a piggy (and we had had 11 of them over 12 years of cavy-caring). I don't know what they cross him with, this one is extremely smart, he will respond to oral command, doing circles, 'shake-paws' with us and jumped hoops. His front paw is flexible (like a squirrel) and often like to grab our fingers, although he got big poo, he is always clean and smells like a plastic toy. We always wondered whether he is a real animal or a fake one. He loves just to stand and adoring stare at us. My daughter always wanted to 'eat' him and wondered whether it was because he was felt so meaty or so cute. ps, I will post a picture of Baldwin once I know how to make them small. My neighbor has a Cuy but I don't think he's aware of that fact. He just thinks it's a big guinea pig. 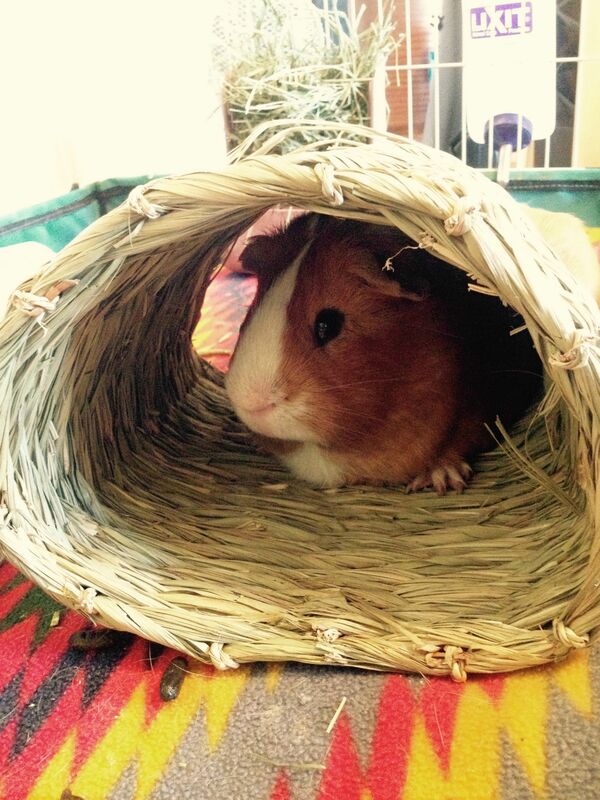 The Cuy is about 2 years old now, was bought at the local Petco (So. Cal. 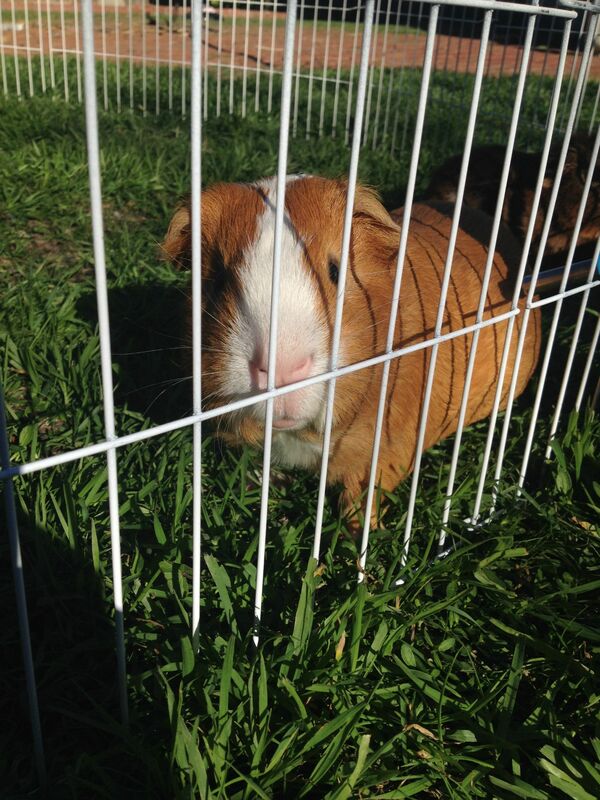 ), is carmel colored, was the size of a full grown guinea pig at 8 weeks, is a male. He's very even tempered, is about 7 pounds now (but is overfed), and does not have any extra toes. He's doesn't seem to have any health problems to date. He also gets all my extra KMS hay which is very nice since it's a quick and good way to get rid of the old batch when the new KMS goes on sale. Did anyone hear about Bea the Cuy? Only 1 1/2 years old...sad. Hannah the Pet Society, she was found as a breeder pig and was saved from living to make babies. None so far but she's only a year old. Purchased at Petsmart in Antioch, CA in April 2013. Weighs 4 pounds and 5 ounces. Very skittish, hides in her house most of the time. Can jump out of playpen. Has pea eye and chronic soft stool/diarrhea. On a positive note, I have not seen any cuy in Petsmart or Petco in about a year now.